This visit was to repair 4 power door locks that were freezing during cold winter days. I was contacted by Kelly Ford to arrange a convenient appointment and was given an approximate time to effect repairs. I had my vehicle washed and delivered on time and the repairs were completed earlier than expected which was great. I would have assigned 5 stars except that all four doors had not been cleaned following the repairs and there was quite a bit of grease that I had to clean from the doors both inside and out. The dealership should provide a reminder to the body shop that cleaning up should be standard practice once a job such as this is complete. Front staff excellent to deal with. I rate Kelly Ford Gander 5/5 stars .I had to take my truck in to have a levelling kit put on & I got top notch service . All the staff were very informative about what was to be done & how long it would take. Even gave me a courtesy car for the afternoon. Excellent service all around. Thank You Kelly Ford. My salesman, Shane Brown, went above and beyond what I would expect from a regular salesman trying to sell a truck. His goal and focus was to get me in a new F-150 no matter what it took. I was deciding between two different dealerships and Shane at Kelly Ford won me over. Thanks for not relenting. 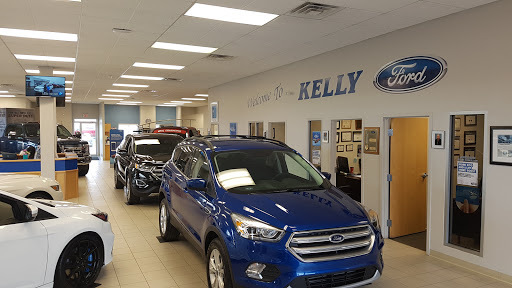 All staff at Kelly Ford were very friendly and helpful! They readily responded to my concerns and made sure that I was happy with the result of their intervention! They even made my coffee and served it with a smile! We found the service which we received from Kelly Ford to be second to none. Their sales associate Jeanette was amazing. She went above and beyond to ensure we were well taken care of. Thanks Kelly Ford. Good experience, my sale man was very informative, answered my questions in detail, would recommend him to anyone.. will do business with him again.. Thanks Jamie..
Kelly Fords service has been fantastic! From the salesperson to the all important service dept, my experience has been awesome! Keep up the good work! I recieve excellent and helpful service from Kelly Ford. Always greeted with a smile and given the best of care. Thank-you for a wonderful experience. Had a little problem with my Ford Taurus, but after meeting with Corey and his team the issue was resolved to my satisfaction. The staff in the service shop were very friendly and super to deal with. Great service and support. Awesome place to buy a vehicle. Staff are second to none, highly recommend to check them out!!!! Just bought another truck from Jamie @ Kelly Ford. Exceptional service, thanks Jamie! Excellent service, products, and customer care! A+ all the way! Very satisfied! Pleased with the service provided, nothing negative to report. It was Fine. I Hate dealerships as they are soooo expensive!!! Service dept and mechanics second to none. Great service. Awesome service....very friendly & professional staff. Great service - always quick to get us in!